My Metro Medallion quilt is finished! I'm really happy with it and yes, I quilted the heck out of it! This block has been one of our favorite designs and so when we made it a QAL, it was lots of fun to see the participation and the beautiful quilts that came from it! The quilting process for this quilt sort of developed as I went along. I ended up doing a few different quilting designs in the blocks in hopes to give some different quilting ideas for the Medallions. I've tried to take pictures of all the different Medallion blocks. I hope I gave some good ideas! The only consistent quilting I did was in the gray parts of the quilt. I used a light gray thread for the gray areas, a cranberry color thread for the red blocks and an off white thread for the rest of the quilt. I also tried out a batting I had never used before made by Pellon, in hopes to find the "perfect batting". I had no problems what so ever with my quilting stitches. Good tension and no skipped stitches. While I was quilting, I wished there was more of a loft, but after taking it off the machine, I couldn't tell the difference in appearance between this and my quilts with the double warm and white batting's. It lay's nice and flat! It has a good weight to it. Not to light and not to heavy and drapes really nice, even though I quilted the heck out of it. I think it will also have a nice lay to it for a wall hanging. One big perk is it's a bleached batting, since so many of my quilts have white in it, this is really important to me. It's not a see through batting, so one layer worked great to make my white fabric in my quilt top really stand out as being truly white! So with all that being said, I like it! I'm going to order myself a roll of it for sure! 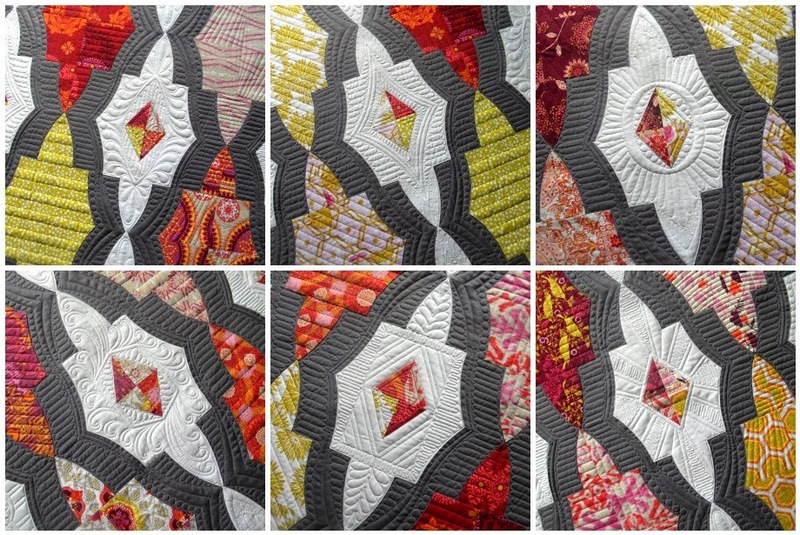 We are going to do one last blog post on the Medallion QAL, showing all the Medallion quilt finishes, quilted or not. So be sure to share your quilt on the Flickr Group or email it to me at jennypedigo@comast.net.